New generation LB balers feature revisions and refinements throughout, to create machines even more productive than their predecessors. Standard feeder LB series balers now benefit from an upgraded chain and tensioner for enhanced durability, while a new packer slip clutch incorporating an additional friction plate made from thicker material provides improved load transfer and heat dissipation for maximum reliability. There’s also a new stronger packer driveshaft, with 33% larger diameter. From front to rear, every aspect of the LB series balers was examined by Case IH engineers to analyse areas where there was scope for improvement. Every major component came under scrutiny, from the pick-up, rotor and pre-chamber through to the packer and knotters. But it wasn’t just those primary components that were revised and re-engineered. Improvements on new LB balers include innovations in headland management and density control, and even developments in simpler but still essential areas, such as tractor couplings and lighting. Stronger pick-up assist auger flights are made from 25% thicker steel, up from 4mm to 5mm, resulting in longer service life, particularly in stalky crop conditions. There’s also a hardened pick-up drive shaft and a new safety clutch, for reduced stress and increased reliability. A new bearing locks the pick-up onto the packer shaft, eliminating axial play, to improve component lifetime. On LB434 XL models, the bale chamber is now 31% longer, having been extended by 80cm. In conjunction with automatic feed rate control, that means you get not just better bale shape and greater bale density, but also more consistent density across the day as conditions change. Bale formation improvements on new LB balers include new reinforced crop holding fingers, a more durable plunger and a new needle cleaning kit. A new advanced multi-sensor miss-tie detection system ensures reliable knotting time after time, while an improved knotter cleaning system keeps knotters cleaner than ever. 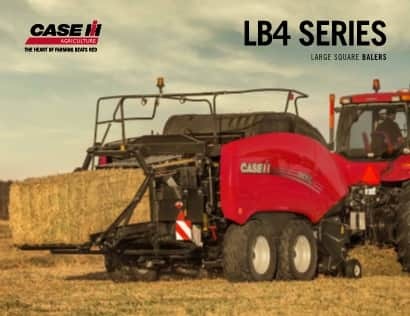 Case IH LB series big square balers are available with single or tandem axles, and flotation tyres for minimum impact on the field and maximum comfort on the road. Every feature on the new Case IH LB balers is designed to ensure you get crop off the field and into the stack as quickly as possible. With pick-up widths of 2m and 2.2m, depending on model, all are equipped with a roller windguard and large gauge wheels with adjustable flotation springs to handle the widest and heaviest swaths. The crop is fed quickly but gently into the baler and delivered to the pre-compression chamber in a smooth and continuous flow with help from two centring augers which now feature stronger flights for improved longevity. Aided by swath-guiding sensors, these help fill the bale chamber uniformly to ensure consistent density and shape for maximum feed value and storage/transport efficiency. Protection of the balers themselves has been improved through the incorporation of a hardened pick-up drive shaft and a new safety clutch, plus a stronger packer chain and tensioner on non-chopper models, and a new packer slip clutch and longer packer shaft. Consistent quality bale production is the essential trait in any baler, and it’s at the heart of the LB4 series design. Each component is created to be robust enough to perform bale after bale, field after field, year after year, whatever the crop type or condition. Our two models cover the key baling sizes, and with packer and rotor cutter options, means there is an LB baler to suit every farming and contracting operation. A massive rotor, available in two widths, uses a series of alternating long and short tines that help prevent rotor blockage. Up to 29 knives (depending on model) can be fitted for a short theoretical chop length of 40mm. On new LB4 rotor cutter models, new options include a biomass-configured pre-chamber and a dealer-installed kit to enhance performance in damp grass. All models benefit from strengthened crop-holding fingers and plunger, plus a new needle cleaner option. As soon as the pre-compression chamber is filled to the required density, the stuffer fork pushes the material upward into the bale chamber, this cycle being repeated until the correct bale length is achieved. During bale formation the bale chamber’s three- dimensional density control system maintains bale shape. A new proportional density control valve allows higher relief pressure, meaning more stable density regulation when working at maximum pressure. Density blocks can be installed to increase pressure when baling dry crops, and an enhanced stuffer trip mechanism prevents false trip detection. With the proven and extremely reliable double knotter system on LB balers there is now the option of an on-board Compressor cleaning kit that further enhances that reliability by keeping knotters clear of dust and debris. In the unlikely event a problem should occur, a new advanced multi-sensor miss-tie detection system is factory fitted. A sensor added to the knotter lock system detects the lock position and alerts the operator at PTO speeds of above 600rpm should a problem occur. As the crop enters the bale chamber, twine is fed from two separate rolls to both the top and bottom of the bale. This system automatically reduces twine tension when working with heavy, tough crops. Each bale has two knots on each twine, the first tying the two twine balls together in readiness to form the bale, and the second completing the bale once the desired length has been reached. The knotters are fitted with individual sensors to detect any miss-tie. All LB4 balers are equipped with roller-type bale chutes that can be folded away hydraulically for safe and easy transportation. Each roller is fitted with sealed bearings for smooth bale ejection and an extended service life. The standard bale ejection system cleans out the bale chamber, while the additional partial bale ejection system works only on the rear section, opening the side walls and allowing the completed bale to be ejected so the bale chute can be folded for transport on the road. The redesigned sidewalls of the compression chamber open up wide to allow any material to be expelled without blockage. This allows proper bale forming from the start after moving to a new field. With the uncompleted bale remaining in the baler chamber, the production of high quality bales can proceed from the start in the new field. A new heavy-duty rotor option for rotor cutter models helps prevent premature rotor wear in abrasive crop conditions, extending rotor life by as much as four times when compared to the lifespan of the standard rotor. It is particularly suited to those customers seeking to bale very abrasive material such as maize/corn stalks or sugar cane trash. The bale chamber on new LB large square balers has been extended by 31% – a total of 80cm – to provide excellent bale control, for density that is both higher and more stable in varying crop conditions, while providing better bale shape and reducing the risk of twine breakage. Bale ejection is now governed by an active rather than passive teeth system which engages the teeth – ten in total – into the bale. Partial ejection is made possible by the teeth that reside between the two main sets of teeth. LB434 XL baler bodies are wider than previous models (from 2500mm to 2800mm), to provide increased space between the side frame and the twine box and reduce crop accumulation in this area. This also provides more space to move around the service platform. Every model still falls within a 3m transport width, even with pick-up wheels in situ. A new work light and service light package is available on LB434 XL balers, featuring modern, bright LEDs for maximum visibility, even in the darkest night. Case IH LB434 XL big square balers can be ordered as single or tandem axle versions. Hydraulic brakes on LB334 and LB434 XL models ensure safe stopping in every situation, while a brake arrangement redesign on new LB XL balers ensures crop cannot accumulate on components. Fitted with quality flotation tyres, the Case IH baler range leaves minimal impact on the land while making road travel a smooth experience. Using the Case IH AFS Pro 700 ISOBUS-compatible terminal, control of LB series big balers is a fingertip operation. Fine tuning of the machine can be done on-the-move from the tractor seat, with a self-diagnostic alarm system keeping you fully informed should any problem occur. A new optional camera monitor kit with a separate 7 inch monitor can be fitted, and allows users to observe camera feeds through this rather than switching between machine operating and camera feed screens on the AFS Pro 700 monitor. In transport mode the PTO speed, hours worked, number of bales plus lubrication and additional operational information can be displayed on-screen. With this mode selected the flashing warning beacon works automatically. In work mode, above 600rpm PTO speed the screen changes automatically; the beacon is switched off and the knotter fans and lubrication system are switched on. The AFS Pro 700 monitor display provides a clear and simple overview of operating status at a glance, providing operators with all the data they need to make informed decisions quickly and accurately. As a result, whether it’s you or one of your operators in the driving seat, you quickly and consistently get maximum productivity from your baler – and that holds true even for those who might be new to Case IH LB4 series balers. In short, these are machines which allow you to quickly extract the maximum from their potential. When in Work mode, a series of automatic alarms monitor twine condition and knife position. They also warn of any miss-ties or shearbolt failures. For additional safety a sensor fitted to the end bale chute roller signals the last bale drop. With ISOBUS III compatible tractors and Feed Rate Control technology, it’s possible for the implement to control the tractor for the ultimate in efficient operation. The load imposed on the baler by the density of the windrow is continuously measured, and this information is used to regulate the tractor‘s speed. That means the combination of tractor and baler is consistently operating at maximum capacity to maintain the highest productivity and minimise fuel consumption. This means not just lower baling costs, but greater productivity and less stress on the operator. If you can‘t measure, you can‘t manage. AFS from Case IH enables data to be recorded in real time, and allows immediate analysis and the formulation of action plans. To supply up to date and accurate information to run the baling operation efficiently, Case IH balers equipped with data collection systems supplying detailed and summarised data on the parameters of each bale (moisture, weight and location in field). The information measures the bale count per field, as well as the total yield, making accurate accounting and planning possible. The data can be expressed via a converter program, into a customisable table showing the parameters of the bale down to the minutest detail (“slice” level) or in summarised form, whichever is required by your customer or for your needs. If the tractor baler combination is equipped with an AFS receiver, the bale locations are defined and can be mapped with the relevant Case IH software, showing location of the bales and yields, allowing the bales to be collected by moisture level, weight or any other parameter. Optional File Transfer uses telematics technology to wirelessly transfer complete bale/field/work data from the AFS Pro 700 terminal in the tractor to the AFS Connect portal to be analysed on the farm office computer. Case IH LB balers are designed to require the minimum of maintenance so that pre-work preparation takes up the minimum amount of time. That means you get out into the field sooner, getting more work done in a day and helping to ensure crop is gathered as quickly as possible before the weather changes. Aside from routine lubrication and servicing, LB balers require little in the way of regular maintenance. Where access to key components is required, easy-opening gas strut-supported panels provide this without effort. A removable twine-box provides easy access to the bale chamber when required. All this results in less time in the yard and more where it matters most – in the field.